11/4/13 - Acquisition - Paris, Musée du Louvre - In our review of the 2009 Maastricht fair, we had reproduced a beautiful painting by Nicolas Mignard, The Rapt of Proserpina (ill. 1), presented at the Galleria Silvano & Lodi. 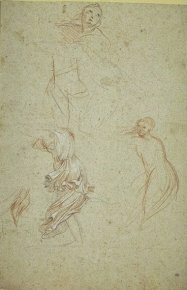 The work had then been exhibited at the Paris-Tableau by Jean-François Heim. It was finally acquired by a Parisian collector, Antoine Béal, who has just donated it as a promised gift to the Musée du Louvre. Mr. Béal has become a regular donor to the museum as he has already offered, again as a promised gift, four other canvases (see news items of 6/11/10, and of 28/6/12). This painting, signed and ated 1651, was produced in Avignon but is however strongly influenced by contemporaneous Roman and Bolognese art (we allude notably to Domenichino), as well as quite obviously, sculpture : the central group evokes the famous Bernini marble found in the Borghese collection. It had remained unpublished until recently and did not appear in the retrospective organized by the Musée Calvet in Avignon in 1979. While the Louvre has a rich collection of works by Pierre Mignard, it did not yet own any by his brother Nicolas. 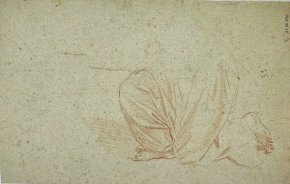 However, it does own over 150 drawings by the latter, two of which are in fact preparatory for this canvas (ill. 2 and 3).